Jesus loved this man, even though anyone else would consider him a lost cause. I spoke with someone today who told me about a disabled man he once cared for in an adult foster home. The disabled man’s name is Daniel. Daniel is angry all the time, he can’t speak, or do much of anything to take care of himself. After working there for awhile my friend was surprised to learn, that up until five years previous, Daniel was happy, and could speak and communicate very well. But over time, due to the rate of turnover for caregivers, the level of engagement with Daniel gradually declined, and so his communication skills and function declined also, until he became the sad figure he is today. In some ancient manuscripts an explanation of the system in place here at the pool of Bethesda is given. The way the system worked, the disabled people would get up and enter the pool whenever they saw the water move, or swirl, or bubble. Tradition said, the first one in the pool after the waters moved would be healed. In our culture, we also have a system. Like the system at the pool of Bethesda, our system is also a system of competition. Just as it was at the pool of Bethesda, in our system the rewards go to the person who is first. My own tendency, probably because of my own competitive nature, is to help those who help themselves. My tendency is to help those who, in my estimation, have a shot at making it into the pool first, so to speak. But that’s not Christ’s way. There’s a great movie that illustrates the way Jesus loved people others would call a lost cause. 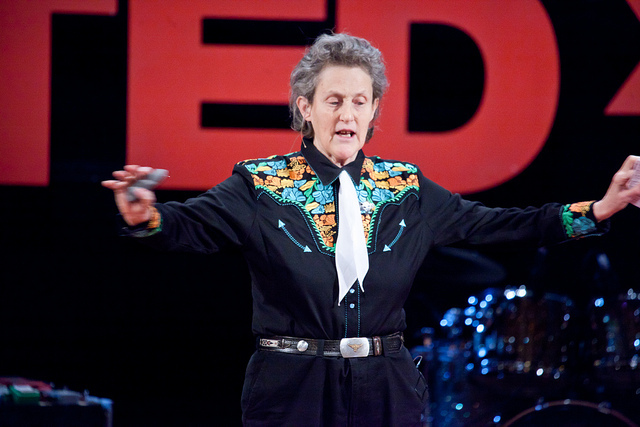 It’s called Temple Grandin — it’s the true story of an autistic girl of the same name. Temple didn’t speak until she was almost four years old. She was diagnosed with autism and the specialists who examined her wrote her off. They recommended her mother place Temple in an institution. But her mother didn’t listen to the doctors. She kept her at home and taught Temple with amazing perseverance and tenacity. Incredibly, Temple eventually earned her Ph.D., and today she’s a professor of Animal Science at Colorado State University. Jesus chose to help a man who had been an invalid for thirty-eight years. Jesus chose to help a man who had no one else to help him. Jesus chose to help a man who was at the back of the pack, who was helpless to win the competition to be the first into the water to be healed. Jesus loved a lost cause. Oh how I’ve blown it with the lost causes in my life! When I see someone who, in my estimation, is a lost cause, I can only think of one word to describe my attitude toward that person, and the word is not love. The man in our story had been an invalid for thirty-eight years. Thirty-eight years! Yet he was the one chosen by Jesus. You and I may not have the power to command an invalid of thirty-eight years to pick up his mat and walk. But there’s nothing stopping us from loving that person. Just taking the time to engage a disabled person with an accepting and loving attitude can make a big difference in his life. Just offering a ride to church to anyone in the lost cause category could be a big deal. You and I should too. This entry was posted in Bible Commentary, Bible Study, How Jesus Loved People - How You Can Too and tagged John 5, lost cause, love, Love like Jesus, love lost cause by Kurt Bennett. Bookmark the permalink. I’ve seen the Temple Grandin movie and it is wonderful! Having a child with a handicap may certainly help one have more compassion for others. One of my twins has cerebral palsy and he is a blessing to not only our family, but an example to the world that handicapped people can make a profound difference in this world. But you are right, Kurt, in that most times we “shun” others because we judge their appearance and we fall headlong into assumption falling prey to dismissal. May God forgive us when we’ve done that. We tend to look at the “lovely” and dismiss the “lowly”. Wow, you brought back to my memory a much earlier time in my new faith in Jesus. I felt like I could accomplish anything by prayer for others, most especially strangers, and there was nothing that was impossible because I just knew God would answer my prayers. At work one day during my break I was sitting on a bench outdoors and along came a pan-handler looking for money. Out of my mouth came, “I do not have silver and gold, but such as I have, I give unto thee…” Then I proceeded to share the Good News with this man. He had tears in his eyes and said that his sister would have liked me because she would have said much the same. Sometimes we don’t have what the person needs physically or financially, but we always have the WORD which will do wonders to lift someone from the depths of despair to which they may have plunged. I too have slacked off in this habit in regard to strangers and have forgotten that sometimes we entertain angels unawares. Another example occurred when our neighbor across the street said that their water heater was not working. I offered a prayer to the Father regarding the problem. I lifted my head up to the sky and prayed something like this: Father, your Son said “Whatever you will ask in my name, that will I do, that the Father may be glorified in the Son. If you will ask anything in my name, I will do it”. (John 14:13) Father, I ask in the name of your Son, Jesus, be glorified and fix my neighbor’s water heater problem. Well, some time went by and I asked the neighbor if her water heater got fixed, and my neighbor said, “No, we didn’t have to get it fixed because you prayed; it is working”. Yes, Kurt, we certainly can’t help everyone…but we can always offer a prayer because we know who can! Thank you for that loving admonition. Great comment Irene, and what a great story about the water heater! Thanks for sharing. God bless you and Mike.